Here at Frontier, we strive to develop fundraising research that always pushes the industry to improve, which in turn helps charities have a greater impact in the world. This means that our marketing decisions are grounded in research and testing in order to produce the best results for our clients and continue shaping industry best practices. To understand how we could improve our direct mail appeals for our clients, we commissioned Predictive Eye Tracking reports one of our mailer designs. Predictive eye tracking is a software model based on decades of neuroscientific research that predicts where on the page readers’ eyes are drawn in the first 3-5 seconds of reading. This enables designers to place key information in spots where it will have the most impact. These tests produce a heat map image of the results, along with statistics relating to page complexity and noticeability. The page complexity score measures how much visual clutter is present on the image. The noticeability metric produces a list of the top elements on the page that will be noticed within the first 3-5 seconds. Finally, the heat map indicates areas of highest focus with red spots. Until recently, the technology to produce these reports was only available for digital mediums, so the newfound ability to test our print campaigns is very exciting. During our first interaction with predictive eye tracking reports for our print campaigns, we learned that user engagement was low on the back page of our direct mail appeal. After analysing the report, we hypothesized that the large volume of uninterrupted body copy on the back page may be the main culprit that was losing donors’ attention. This provided us with an opportunity to optimize this space to emphasize the client’s message. But how? This discovery was a call to immediate action for our team! We got creative with the next direct mail appeal we sent out. This currently under-utilized space had the potential to leave a large impact on current and prospective donors; our challenge was to utilize it in such a way that it added value for the client. So, our team developed the idea of creating impact statistic graphics to insert on the back page. Not only would this give the eye a place to land by breaking up the text, but it would also provide a space to further emphasize important points to the donor. Most importantly, it would allow a donor to visualize how they can be the hero in the story, all within the first 3-5 seconds of flipping over the appeal letter. Impact statistics offer tangible and visual metrics that are quick to digest, all while emphasizing the impact donors can have on real lives. However, at Frontier we are not satisfied with assuming we’ve solved the problem; we test to ensure it’s solved. So we ordered another predictive report, this time on our new design. The results came back overwhelmingly positive: the back page received a focus rate score of 93.7%, which indicates highly focused attention. Additionally, the new impact statistic graphic was the top focus item on the heat map. Essentially, the new infographic stole the show, dramatically increasing overall donor engagement with the page. Not only did the Predictive Eye Tracking test results prove that this was a worthwhile change, but the real life results we have seen from our clients also verify this. 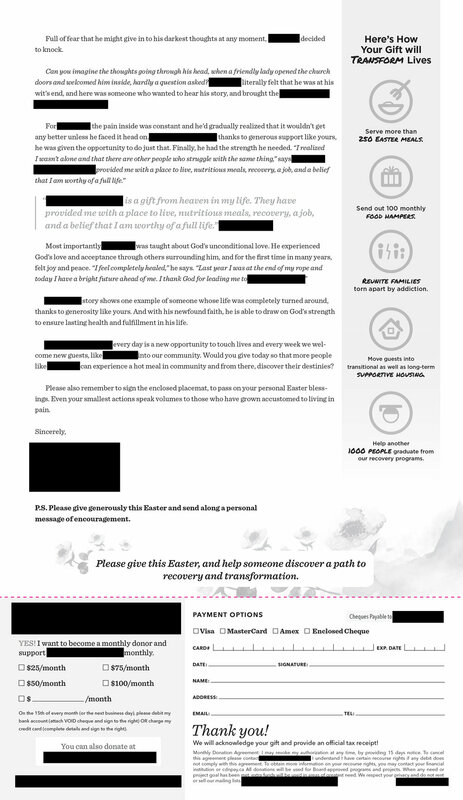 The success of this design means that now we have another strategy for effectively communicating clients’ messages to potential donors. Since confirming our theory with the predictive eye tracking test and seeing our clients’ real-life fundraising results, we have gone on to integrate this design into many of the mailers we create for our clients. But we haven’t just inserted basic impact statistic graphics into all our mailers. We have taken the principles of these solutions and tailored them to each of our client’s individual needs, based on who they are as an organization and even when in the year the campaign launches. This design has contributed to the success of numerous mailers, and is particularly applicable for campaigns with tangible asks. By sharing this type of research publicly, Frontier continues developing our industry’s understanding of effective fundraising practices. For example, our general manager, Mariam Ghani, presented these findings at the 2017 Pursuit conference in Edmonton, AB so that other fundraisers could gain from our research. Through research like these tests, our goal is to help shape industry best practices so that organizations like our clients and can raise support more effectively than ever before.